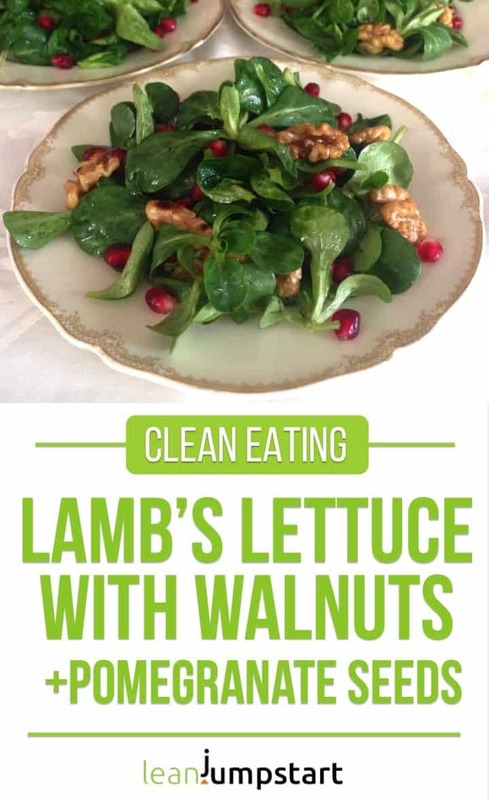 I’ve included this delicious lamb’s lettuce salad already several times in my Christmas menu. But in fact, it will rock any menu throughout the colder season. 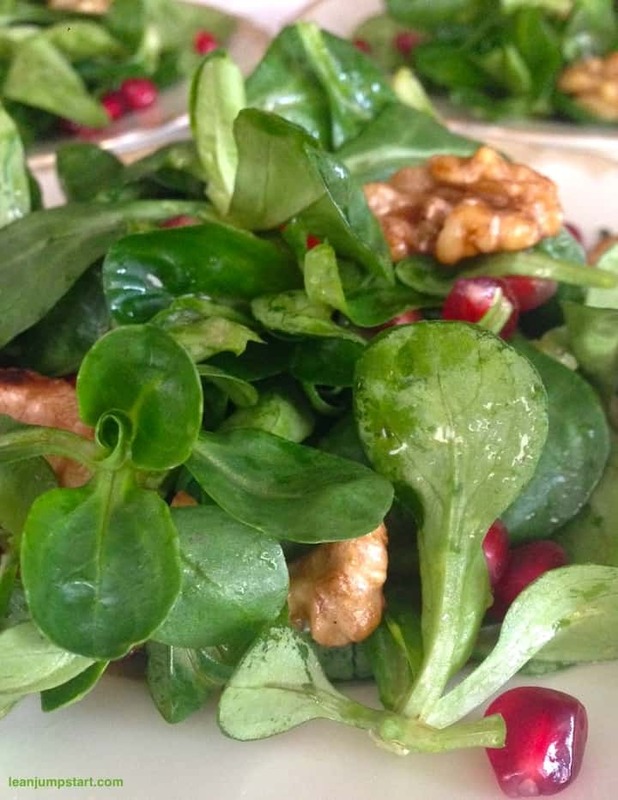 Doesn’t this leaf salad just look gorgeous combined with the nutrient-rich walnuts and sprinkled pomegranate seeds? For me, these red seeds always resembled little shiny Christmas bulbs. Together with the green lambs lettuce rosettes, they create a festive Christmas impression. What is mâche or lamb’s lettuce salad? This tender leaf salad can also be found under the name lamb’s ear lettuce, mache lettuce, mâche rosettes, corn salad, corn lettuce, Rapunzel, field salad or the Latin name “Valerianella locusta”. It has spoon-shaped dark green leaves, and a tangy, nutty flavor. While it is a very common crop in Europe, I realize that these mâche rosettes are not so present in American’s kitchens. At least I didn’t find many mâche recipes on Pinterest…But don’t worry, I’ll give you some tips where you can buy them in the US at the end of this blog post. Did you know that mache rosettes are one of the most nutrient dense leaf salads? So, if you are a health-conscious foodie – you are reading this blog, so you probably are – then mache lettuce is a must. I’ll share more about its nutrition facts later. In fact, it is a typical winter salad which is mostly sold from autumn until early spring. As I prefer to eat veggies in the season I often can’t wait the opening of the “Feldsalat Season”. 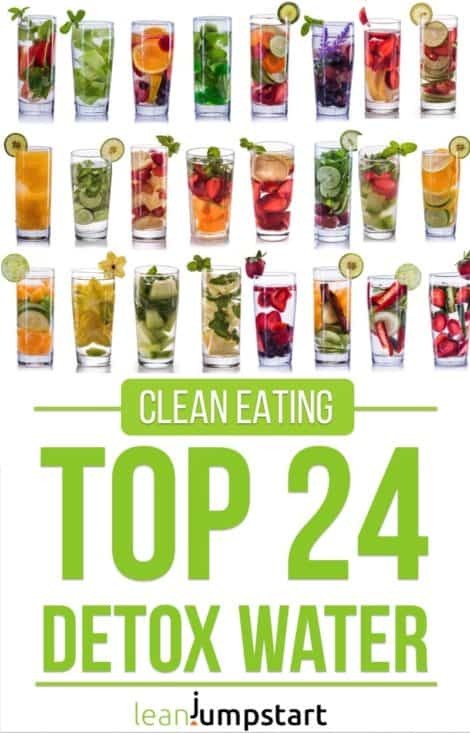 For a clean eating salad, I usually combine it with just some thinly sliced onions and a simple vinegar oil dressing. But for Christmas, it’s nice to include some “whistles and bells”. Although I’m not living in the USA I researched (with the help of a wonderful Facebook group) that you can buy Lamb’s lettuce at your local Whole Foods, Bristol Farms or Meijers in the boxed salad greens section. The brand “Iloveorganicgirl” sells it under the name “mâche rosettes”. They are even washed so you don’t have to. The only thing you have to remove is the tiny part of the root at each rosette. 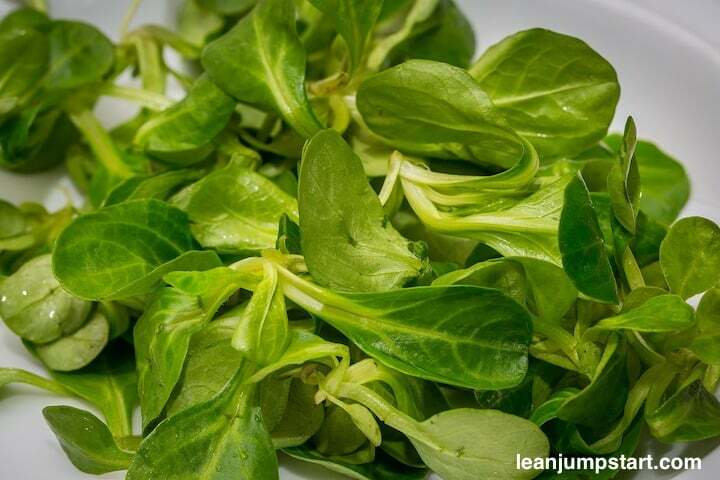 You can mimic the look of this recipe and use baby spinach leaves instead. Lamb’s lettuce is anyway often confused with baby spinach. Ok, you won’t have the rosettes and all its nutrients but at least the leaves seam similar. Lamb’s lettuce has many nutrients, with 3 times as much vitamin C as lettuce it is super-charged with Vitamin C and it provides 14 times as much pro-vitamin A as iceberg lettuce. (1) Mache is also a great source of beta-carotene, B6, potassium, and iron. To reap most of its nutrients it is best to eat it in season and as fresh as possible. First, fill your sink with cold water. Wash the salad thoroughly in water at least once, as the mache rosettes are often very sandy. Take it out, let it drip off or carefully spin it dry in a salad spinner. 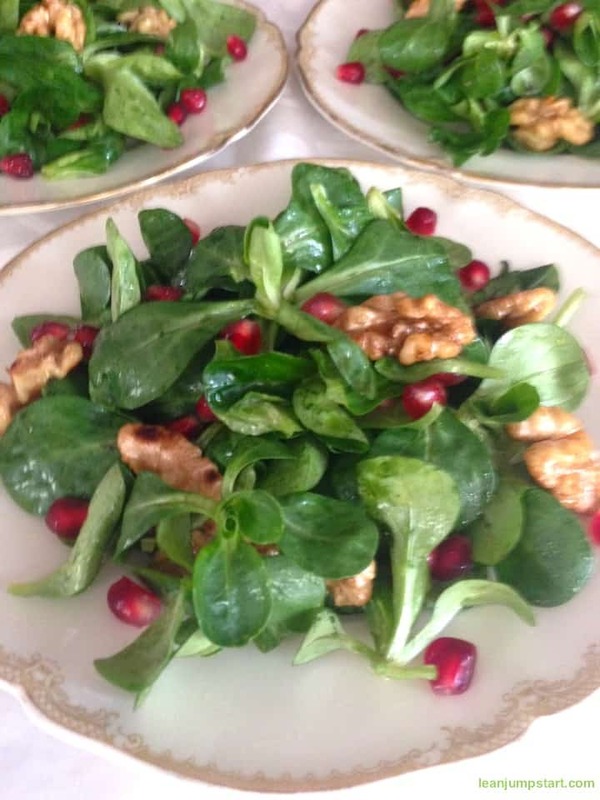 Here is finally the recipe for my festive salad recipe. Add walnuts and stir for 5 minutes. Turn off the heat and add coconut oil, maple syrup, and salt. Toss to coat the walnuts. In a large bowl, combine vinegar, olive oil, salt, and pepper. Put washed lamb’s lettuce in the bowl and mix well. 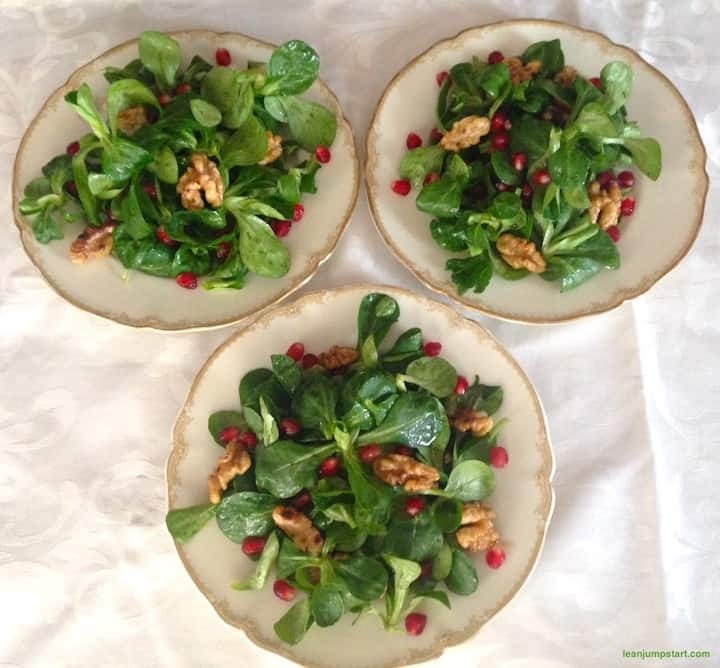 Garnish each salad plate with the walnuts and pomegranate seeds. Look, it took me almost an hour to thoroughly wash the salad as it was quite grainy and gritty. I can’t even imagine how long it took him to find and pick all those tiny, small rosettes from the field. I know what you are thinking…But hey, that was probably the freshest, most organic and nutrient-rich lamb’s lettuce we’ve ever eaten. Before you run away and forget about this vitamin bomb, let me reassure you…the mache rosettes you get in the store nowadays are for sure much larger, cleaner and especially in the US they are offered prewashed. So, don’t you think it’s time to include this precious little greens into your whole food’s nutrition? Lettuce can be kept for a few days in the vegetable compartment of the fridge. The ingredients and flavor, however, are lost during storage and the leaves wither quickly. So fresh especially with the pop of pomegranate seeds! Thank you, Tilly. Yes, the pomegranate seeds make this salad especially juicy and fresh. The use of pomegranates really makes this a great salad. Looks really good and perfect for light dinners. Thank you Sharon, yes it could probably work also as a light dinner, maybe with some whole grain bread. Delicious salad love the added texture! Thank you Tisha, that’s what we love too. I could eat this every day! It looks fantastic! Thank you, Andrea, yes I could it eat every day too:) This is one of those seasonal salads I wished it would grow all year around.